Don’t give advice before you see how the witness performs. If you went to the doctor and the first thing he said was, “Ok, I’m going to give you a prescription for Ritalin that you’ll need to take 3 times a day,” you’d run out of the office. What type of a doctor would make a diagnosis without reviewing your symptoms? What type of doctor would write a prescription without hearing what was wrong? Don’t make the same mistake with your witness. Don’t prescribe a remedy until you’ve gotten the chance to see the witness perform on the witness stand. Put them in the witness stand and start firing away with your questions. Ask short questions, long questions, open-ended questions, leading questions, and accusatory questions, then watch how the witness performs. Only then should you make any recommendations. How does the witness sound? Does he need to speak up? Or is he so loud that the jury will be blown back in their seats? Is he making “popping” noises in the microphone? Speaking too quickly? Too slowly? Is he using incomprehensible buzzwords or jargon to explain what happened? Saying “uh” or “um” too often? Does he articulate his words, or does he mumble? Does he fade away at the end of sentences? How does the witness act? Does he become confrontational when you switch to cross-examination? Does he change his body language based on the questioning style? Does he get defensive when you switch to certain topic areas? Does he change the tempo of his answers (sometimes pausing for an extended period before answering, and other times answering immediately) based on topic areas or questioning styles? Does he interrupt before the question is completed? Does he try to look at you (“Help me, please!”) during cross-examination? Limit your initial comments to a few simple improvements. 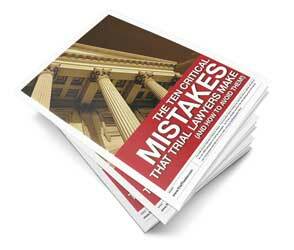 When I coach trial lawyers about improving their courtroom skills, I try to make only one or two specific comments. Giving someone a 30 point plan of action for improvement has the same effect as not giving them any guidance for improvement. 30 points are too many — they’ll feel that they can’t do anything right, and will just give up. But if you give them a few, limited areas for improvement, they can do that. And then next time, you can give them 2 or 3 more things to improve upon. Be honest. Don’t say something nice just to give false praise. Only imbeciles are unable to recognize false praise. Everyone else hates it. And you’ll offend them. If you can, it’s nice to tell them something positive about their performance, but don’t lie or B.S. ’em. If the witness is sincerely interested in improving their performance, they’ll appreciate your candor. Preparing witnesses to testify is one of the most important pre-trial functions a trial lawyer can perform. Get the most out of the limited time you’ll be able to spend with each witness. Apply these guidelines to your pre-trial preparations and you’ll see dramatic improvements in your witnesses’ courtroom presentations. Advocacy is an art which a lawyer should acquire.